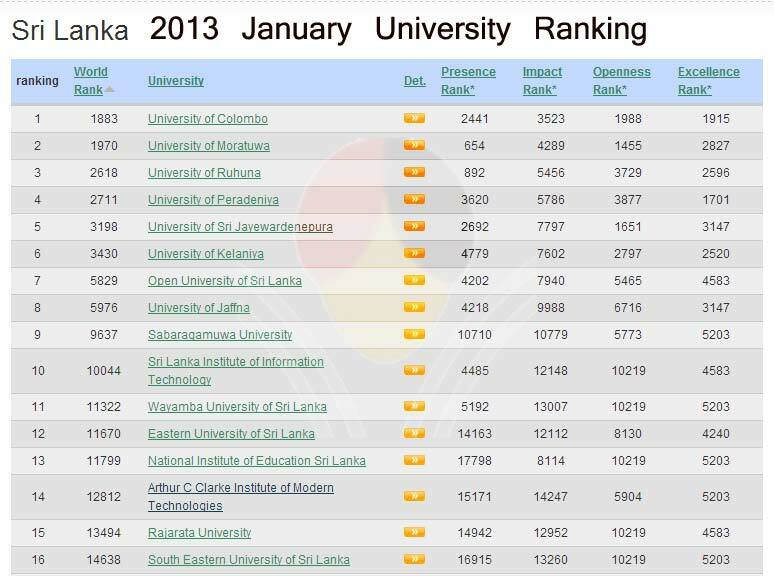 According to the latest Webometrics rankings issued in January 2013, top 30 Universities in Sri Lanka are given below. According to this list top five Sri Lankan Universities are University of Colombo, Moratuwa, Ruhuna, Peradeniya and Sri Jayewardenepura. Compared to last ranking issued in 2012 July, world ranking of some Sri Lankan universities were improved: University of Ruhuna and University of Moratuwa. However world ranking of some universities decreased slightly: University of Colombo, Peradeniya, Jayewardenepura and Kelaniya, which may be due to the change in assessment method of university rankings. The Ranking Web or Webometrics is the largest academic ranking of Higher Education Institutions. Since 2004 and every six months Cybermetrics Lab (Spanish National Research Council, CSIC) in Spain publishes this ranking based on their web presence and impact. The quality of the contents is evaluated by counting all the external inlinks that the University webdomain receives from third parties. PRESENCE (1/3). The total number of webpages hosted in the main webdomain (including all the subdomains and directories) of the university as indexed by the largest commercial search engine (Google). OPENNESS (1/3). The global effort to set up institutional research repositories is explicitly recognized in this indicator that takes into account the number of rich files (pdf, doc, docx, ppt) published in dedicated websites according to the academic search engine Google Scholar. EXCELLENCE (1/3). The academic papers published in high impact international journals.